The folks at Alamo rental car are currently running a sweepstakes with the grand prize winner taking home a 2014 Ford Mustang Convertible - along with other prizes that include free rental cars and round trip flight vouchers from Southwest airlines. 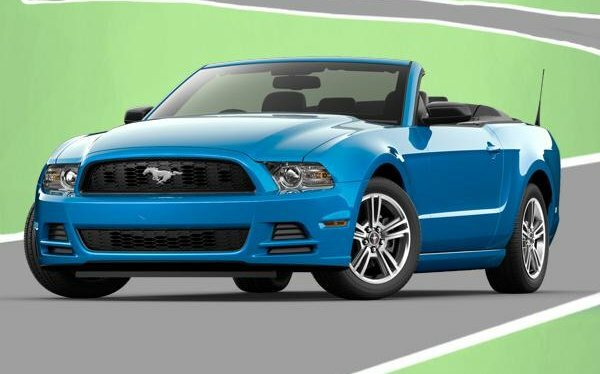 The Alamo rental car company has teamed up with Southwest Airlines for their Top Down, Wheels Up Sweepstakes with the Grand Prize being a 2014 Ford Mustang V6 Convertible. First Prize is a pair of round trip tickets from Southwest Airlines to anywhere in the United States and a free 7-day rental from Alamo while Second Prize is a 7-day rental from Alamo. The 2014 Ford Mustang V6 Convertible has an approximate retail value of $29,000 which means that the winner will take home a “base” convertible Mustang as the V6 Convertible Premium has an MSRP starting over $29,000 but the winner will be able to chose the details including the exterior color and interior color. Also, per the fine print details of the Grand Prize, the winner will also be able to add features to their free Mustang at their own expense so perhaps the company would allow the winner to pay for a V6 Premium with the winner paying the difference between the two. In any case, winning a free 2014 Ford Mustang Convertible would be awesome regardless of what features it includes and if, for whatever reason, you really don’t want the free 2014 Mustang – the Grand Prize winner can opt for $20,000 cash instead of the free car. The fine print for the Top Down, Wheels Up Sweepstakes are vague in relation to what types of rental cars the First and Second Prize winners get but with an approximate retail value of $400 for the 7 days, the winner should be able to pick from a long list of vehicles ranging up to a large sedan – although it is unclear whether a Mustang Convertible is an option. It will likely depend on the location from which you plan to pick up your free rental car. Best of all, it is free to register to win the 2014 Ford Mustang, the airline tickets and the rental car vouchers and interested parties are not limited to just one entry. In fact, you can sign up once each day and in addition to your basic registration, you can earn three additional entries a day by recommending three friends each day. In other words, between now and when the sweepstakes ends on November 15th 2013, you can earn 4 entries each day if you meet the basic requirements. With 46 days until the entry period closes, you can score yourself 184 entries to win the 2014 Ford Mustang. Click here to head over to the Alamo Top Down, Wheels Up Sweepstakes page to register to win a 2014 Ford Mustang V6 Convertible!